"You're beautiful and I'm handsome, That'll be good for the babies. I know we aint got no strings attached, But this could be a perfect match!" I usually think lyrics in a blog post are about the damn dumbest thing I've ever seen, but I'm allowed to do it ONCE. If I do it more than once, call me out on how whack I am. Anyway, this post was fun, I turned up the ruffian with my Boo Thang, Jorden Lyric. Me and Jorden's fine self are going to Urbanize you. Kapone. Saggy jeans aren't my thing. But, these "Shorty" jeans fit surprisingly well. They're also unisex! 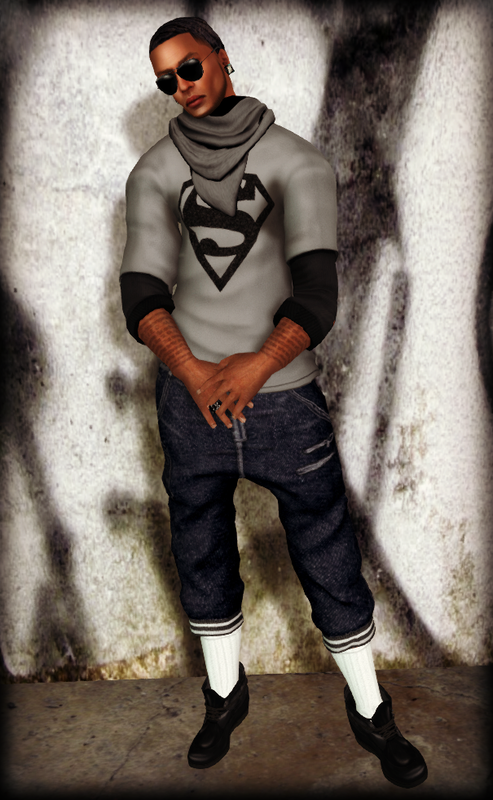 My Boo Thang, Jorden is wearing the "Superman" sweater which is ONE of about 5 different stylez, and comes with an optional bandanna. My sweater is from .:SS:. and no I don't know what the abbreviation meanz. This "Black Plaid" sweater comes in about 5 different styles as well, but I dig plaid. So if you're looking to match with your own boo, or just get a little punk, Kapone and .:SS:. are great placez to check out and clothez start out at $50L!